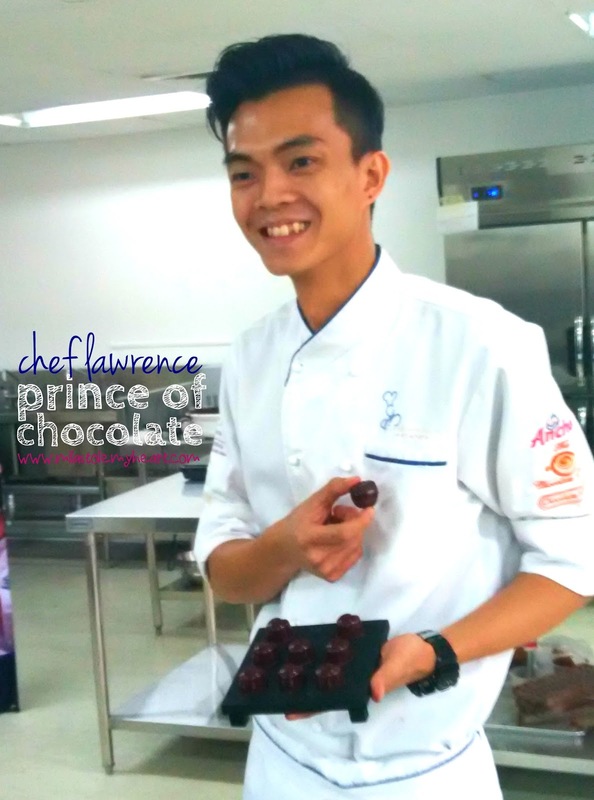 During the demonstration, Chef Lawrence wowed us with his mastery of chocolate. He works quickly, making sure his chocolate is tempered properly. At the same time, he was thorough in explaining each step of the process. Now I understand better how chocolate making is a tasteful mix of science and art. 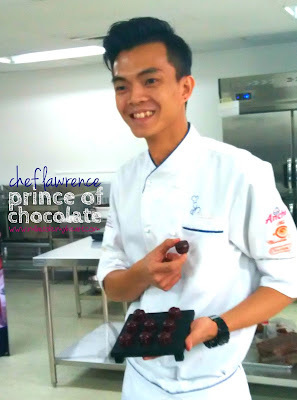 According to Chef Lawrence, there are three main types of chocolates: dark chocolate, which mainly contains cocoa bean mass, cocoa butter, sugar, lecithin and vanillin to enhance the flavor; milk chocolate, wherein a part of the dry components of the cocoa are substituted with milk components; and white chocolate, which undergoes the same process as dark and milk chocolate but does not make use of cocoa bean mass or powder. 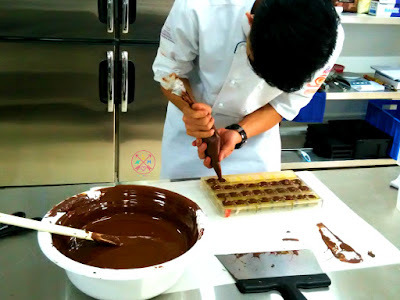 Among the three, he prefers to use dark chocolate, especially during competitions because it has the “taste of real chocolate”. He also prefers to use Belgian chocolate such as the Callebaut. “In choosing a chocolate, what’s important are the taste and the texture,” he explains. Chocolate's taste and texture though are products of a variety of cacao trees, where it was grown, and how it was processed (fermented, dried, roasted, and tempered). 1. 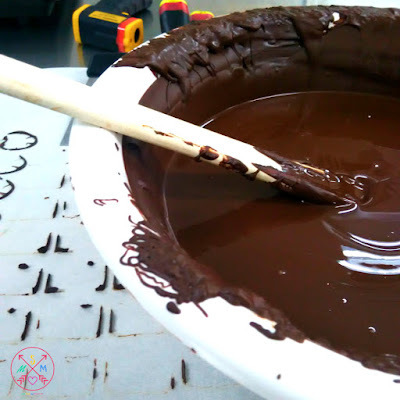 Tempering is the most critical part of making chocolate. If done properly, you will have a smooth, glossy finish. Poorly tempered chocolate will have an unsightly white coating with a soft, sometimes grainy texture. 2. There are different ways to temper chocolate but the cleanest and simplest, according to Chef Lawrence is to use 1% of cocoa butter. 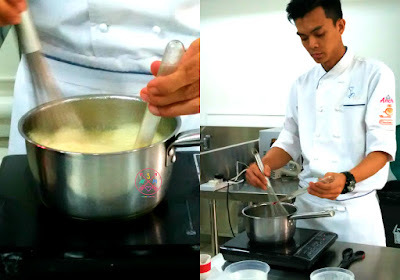 The Academy of Pastry and Bakery Arts uses Callebaut products and you can go to their page for instructions on tempering chocolate using cocoa butter Mycryo. I wonder how anyone could resist this. I just want to take a finger, dip it in the chocolate and just lick it! 3. When making dark chocolate ganache, mix it with milk chocolate. Pure dark chocolate can be too hard and rough. 4. The molds you use play an important role in getting beautiful, glossy chocolate. Choose shapes that are curved so it will reflect more light. When cleaning up, avoid using water. Just use baking heater to melt the chocolate, the wipe with cotton to clean. Cover with plastic wrap to store. 5. It is best to let the chocolate sit on a dry, cold room overnight, instead of putting it on the refrigerator. A very thin layer of water can form on the surface of the chocolate inside the chiller which will contaminate the chocolate. It will affect it's thickness and will not store well. 6. Thermometers are very important in chocolate-making. Too high or too low temperature will cause the chocolate to not form properly. 7. In using jelly or liquid filling (like the lime jelly that Chef Lawrence made), put it on top and fill about 20% of the shell. The rest should have the ganache which is more solid and heavy so the fillings would not spill as you bite on the truffle. 8. To make a more interesting truffle, you can infuse the cream you will be using for the ganache with different flavors. Chef Lawrence prepared coffee and earl grey flavored ganache, but you can use other ingredients and experiment with the flavors. 9. You can put the truffles in the chiller for a short period, if you need it to set fast. 10 to 15 minutes could be enough to let it set. 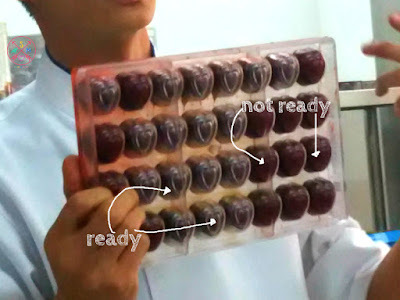 Using transparent mold helps you easily check when the shells are ready. If you look at the photo below, you can see that the chocolate releases itself from the mold when set. 10. Lastly, chocolate is best enjoyed when made with love! Really, too much chocolate may not be good for the body but it's definitely good for the soul! To sum up, I now know why truffles can be expensive. It takes skills, technique and pure love to make that perfect little bite of heaven. 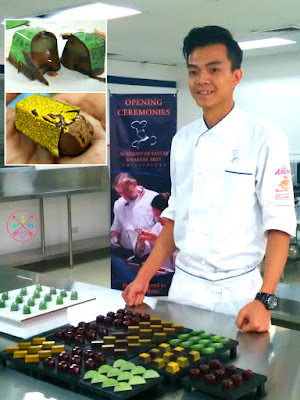 Lucky the Academy of Pastry and Bakery Arts, Philippines is now offering classes to teach you how to master chocolate. 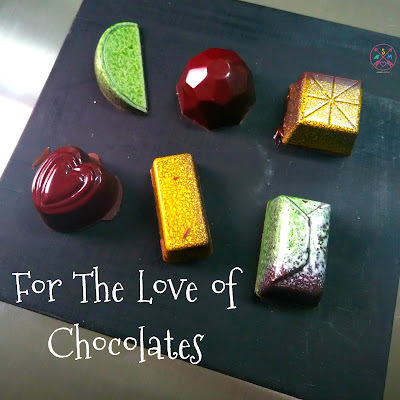 If you are free this weekend, get your love of chocolates to the next level. 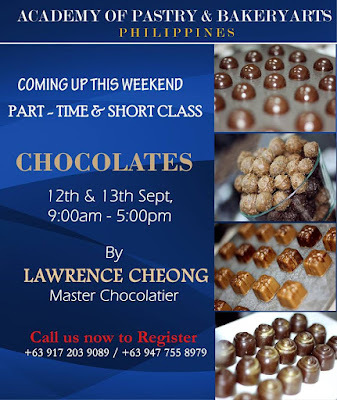 There's a 2-day short Chocolates Class at the Academy and it only cost P6,000. 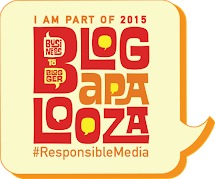 Grab the chance to learn from the master! Chef Lawrence is just one of the many Master Chefs from across the world, who are teaching at The Academy of Pastry and Bakery Arts Philippines. 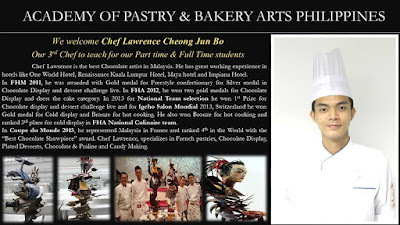 For the schedule of short and full-time courses, visit their website academyofpastryartsphilippines.com or contact the Academy at 0917-2039089 or 0947-7558979. 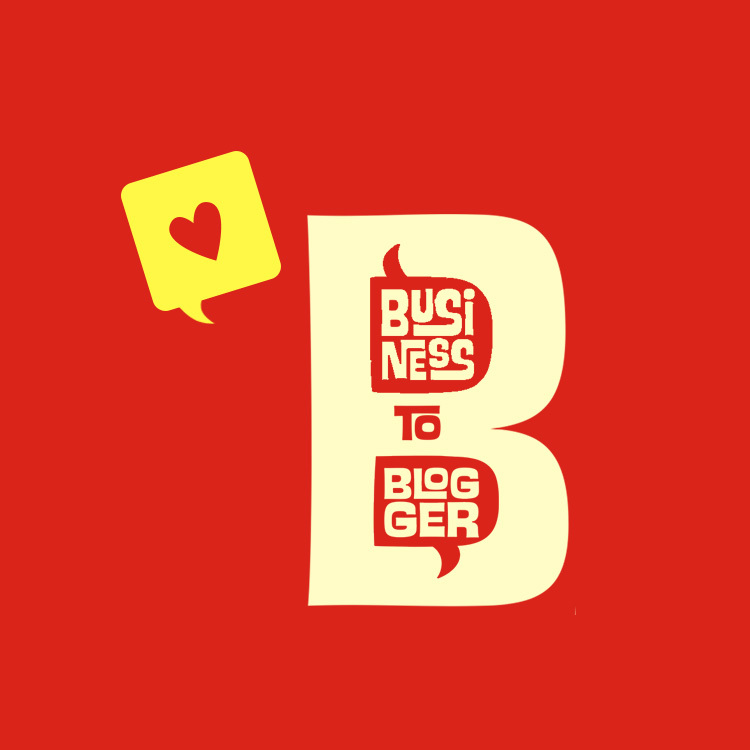 Classes are held at the 4th floor of Metro House Building in Gil Puyat, Makati.